Click on each panel in the photo above to see it enlarged. 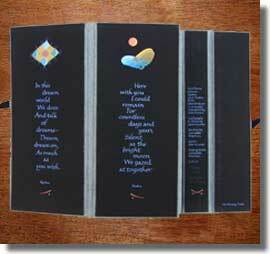 An original artist's book: Calligraphy and illustration by Sherrie Lovler, binding by Georgette Freeman. Love Poems between Ryokan and Teishin (Zen poets from the early 1800s) from Dewdrops on a Lotus Leaf, Translated by John Stevens, ©1993. Reprinted by arrangement with Shambhala Publication, Inc., Boston, www.shambhala.com. Published by Ink Monkey Press 2005. This is an edition of 10 books, each one hand lettered and bound. Number 4 of 10 is available now. For further info call Sherrie at 707-528-1723. Individual pages are available as limited edition giclée prints. This book is bound as a French Tablet. It can be held as a book or displayed open. 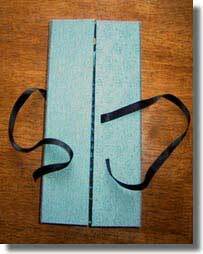 The binding cloth is Japanese silk brocade. Each panel is 9-1/2 by 4 inches, the whole book is 9-3/4 by 47 inches. Legacies Faculty Show. The 25th International Lettering Arts Conference in Dallas, July, 2005. Letter Arts Review 2005. Juried show. Vol. 20 No. 3 Love Poem #5.